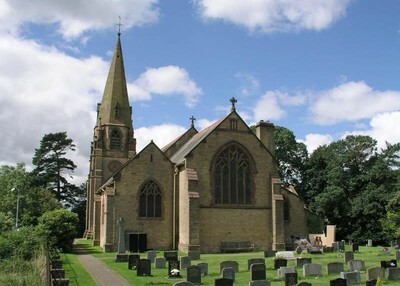 The spaces in the present Regimental Columbarium in St Lawrence Church, Barton, are either occupied or reserved. 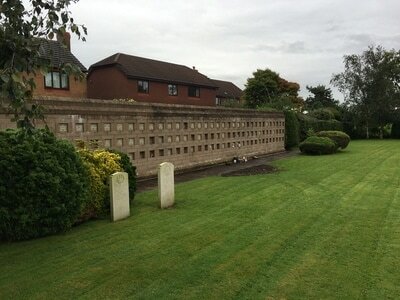 If Association members are to have their ashes interred here in the future, then a new wall must be built at a cost of around £30k. For those who are not familiar with the Regimental graveyard, it is situated at the Church of St. Lawrence, Garstang Road, Barton, Preston, Lancashire, PR3 5DR. Within the graveyard is a columbarium wall into which Ashes may be interred (see the pictures above). We believe that our Regimental graveyard and columbarium are unique. Members of the Association can reserve burial plots in the Regimental graveyard, or places for Ashes to be interred in the columbarium wall. The costs are minimal in that a small reservation fee is required, which goes towards the upkeep of the graveyard. Reservations are made via HHQ. Undertaker, Grave Digger, Headstone and the Vicar's Fees. Undertaker, Cost of small casket (to contain the Ashes). Name Plaque (supplied by a local Stonemason). A Grant from the Regimental Trust Funds. Reservation fees from those reserving places in the columbarium wall. Donations towards a Regimental Columbarium Appeal Fund. Donations made on-line at the Regimental website or by cheque to HHQ. Before proceeding with this considerable outlay, the Trustees would like to gauge the the need for a new columbarium wall and the interest amongst Association members to support fundraising efforts. To that end you are asked to complete the survey below (without commitment) and press "Submit". ​If you wish to help with the Regimental Columbarium Fund Appeal, please answer the questions below and press "Submit"
Yes, I would consider contributing to the Regimental Columbarium Appeal Fund (this is not a commitment). Yes, I would be interested in reserving a place in the Regimental Columbarium in the future (this is not a commitment).